In my latest column in the j. newsweekly, I celebrate my rediscovery of the noodle kugel, a baked noodle and egg dish often called a noodle pudding. I’ve eaten my share of gloppy, indiscriminately sweet noodle kugels (also known as luchen kugel in Yiddish) and had kugels served with dinners that were nothing more than desserts in disguise. Then I had the kugels made by my friend Karen Bloom. Hers were light and fluffy, tasty and varied. Her noodle puddings were in a different class. She comes by it naturally; her cousin, Nina Yellin, has written two kugel cookbooks and Bloom has based several of her creations on her cousin’s recipes. Bloom recommends whipping the egg whites separately and folding them in last to keep kugel lighter. 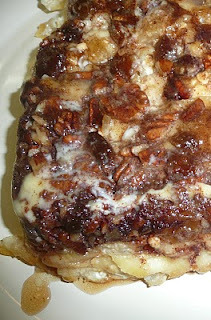 I took her advice and made a fragrant and sweet Cinnamon Bun Kugel. It was adapted from Yellin’s latest cookbook -- Kugel, Knishes, and Other Tasty Dishes, Smylan Reed Books. (FYI -- The book was published in 1993 and seems only to be available used.) The kugel’s spicy warm scent entices as the oozing cinnamon, brown sugar and butter topping melts into the creamy noodles. But a kugel need not be sweet and creamy. Onions, garlic, and all sorts of vegetables are featured in Yellin’s recipes, so I devised a savory kugel that draws on Sephardic influences including toasting the pasta to add extra flavor. Baked Fidellos Tostada with Sephardic Flavor combines the nutty flavor of the pasta with the earthiness of chickpeas, cumin and saffron, and the bright tastes of lemons and tomatoes. Use vegetable broth to keep the dish vegetarian or punch up the flavor with chicken broth. You can read my article in the j. here. A small piece is perfect for dessert or as an accompaniment to brunch. If you want to trim back a bit on the fat without loosing the lusciousness, substitute low-fat sour cream, cottage cheese and milk. If you want to try Yellin's original recipe, use a 10x10-inch pan, a full stick of butter, 1/2 cup of chopped walnuts instead of the pecans and crushed, drained pineapple instead of the applesauce. Preheat oven to 350 degrees. Cook and drain noodles. Beat yolks and mix with sour cream, cottage cheese, milk and sugar. Combine apple sauce with ¼ tsp of cinnamon, add to egg yolk mixture. Mix in noodles and combine. Beat egg whites until stiff and fold into noodles. Melt butter and pour into 8”x8” baking pan, being sure to fully coat inside bottom and sides. Scatter remaining cinnamon, brown sugar, pecans and raisins on bottom of pan. Stir. Pour noodle mixture into pan. Bake for 50 minutes or until kugel is firm to the touch. Invert on serving platter to serve immediately, serve out of pan, or store in pan and warm before inverting and serving. I ate the leftovers for lunch for several days -- it only got more delicious, so try making this one in advance and reheating it. Heat oven to 400 degrees. Spray baking pan(s) with oil spray or grease with olive oil. Spread broken pasta pieces out in a single layer. Toast in hot oven until lightly browned, turning over often. Cook in boiling, salted water until just cooked. Drain. Set oven to 350 degrees. In a large frying pan over medium high heat sauté onion until golden, add garlic, sauté a minute or two, add cumin, oregano, thyme, salt, black pepper and pepper flakes. Sauté a minute and then add in carrots, celery and red and yellow peppers. Sauté until vegetables are browned then add the tomatoes with liquid, chickpeas, stock and saffron threads. Simmer until vegetables are just cooked. Mix in lemon juice. Combine with cooked pasta. Add in lemon zest and ½ cup parsley. Taste and correct seasonings. Mix in eggs. Spray or grease a 10”x14” baking pan. Pour pasta mixture into pan. Sprinkle paprika on top. Bake for 45 to 50 minutes until lightly brown and firm to the touch. Garnish with chopped parsley. Serve hot or at room temperature. Other kugels on the web: a traditional style noodle pudding from Smitten Kitchen and a cornflake topped one from David Lebovitz. My friend Karen makes a similar one using frosted flakes as a topping. Update: 12/10 -- I've posted my California Kugel recipe full of chopped fruit and granola. About the photos: Top -- my cinnamon bun kugel oozing. 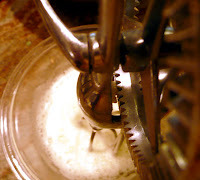 Bottom -- whipping the egg whites. My cookbooks have been self published since 1988 under the name of Smylan Reed Books. The first title was "The Kugel Book Featuring Madam a la Kugel." Only 500 copies of that title were printed. I revised and changed the title to "The Kugel Story, Not Just Noodle Pudding" and "The Kugel Story, Not Just Noodle Pudding 2" printed in 1991, 1992 and 1993. In 2001 I released another revised edition titled "Kugel, Knishes and Other Tasty Dishes." I believe that is the edition you took the recipe from for your article. Copyright date is at top of copy right page and the book was actually self published in 2001. There are only about 6,500 copies of my books in the world. The have appeared recently online in the rare book market for over $200.00. cinnamon bun kugel!? i am jewish, and i've never tried such a thing. definitely bringing this to my next sedar! I'm sorry to say that unless you use special passover noodles made with matzoh meal instead of flour you can't bring this to a seder. But it's good any other time, though.